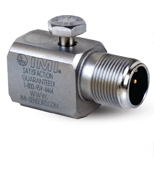 Also known as seismic vibration pickups, industrial accelerometers are rugged, stainless steel vibration monitoring sensors for predictive maintenance applications. All IMI sensors are hermetically sealed and case isolated. Our integral cable units are submersible and IMI’s vast product line includes high temperature models (both charge mode and ICP®) and dual output temperature and vibration sensors. 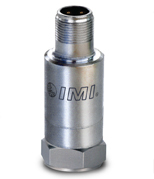 IMI sensors interface directly with handheld data collectors for both permanent mount and route based applications. 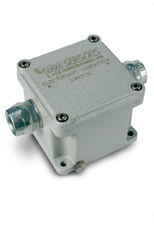 IMI’s new line of electronic vibration switches provides the total vibration monitoring package. Each model 685B vibration switch features 4-20 mA output, analog vibration analysis signal and dual relays with time delays standard. Our model 686B is simple and inexpensive two-wire USB programmable electronic vibration switch. The 686B vibration switch's programmable time delay eliminates false trips, making it a technically superior option to traditional mechanical shock switches. Electronic vibration switches are a great way to get your plant started towards a predicitive maintenance program and provide protection for your most critical equipment. Around the world the IMI team is available for demos of their USB programmble vibration switch as well as 685B "fully loaded" vibration switch. This is an overview of our most popular vibration switch models. To see more vibration switch options click on a subcategory below.